Tally Ho is an unusual game thanks to the theme chosen for it, but Microgaming pulled it off and managed to offer in it a fun experience. The British nobility have a tradition when it comes to fox hunting, dressing up in certain types of suits and riding on horses when they go out. Well, Tally Ho is a game where foxes are the nobility and they are dressed the part, they drink teas, eat sandwiches and live in mansions. The actual design style is somewhat dated, but the idea behind it is great. 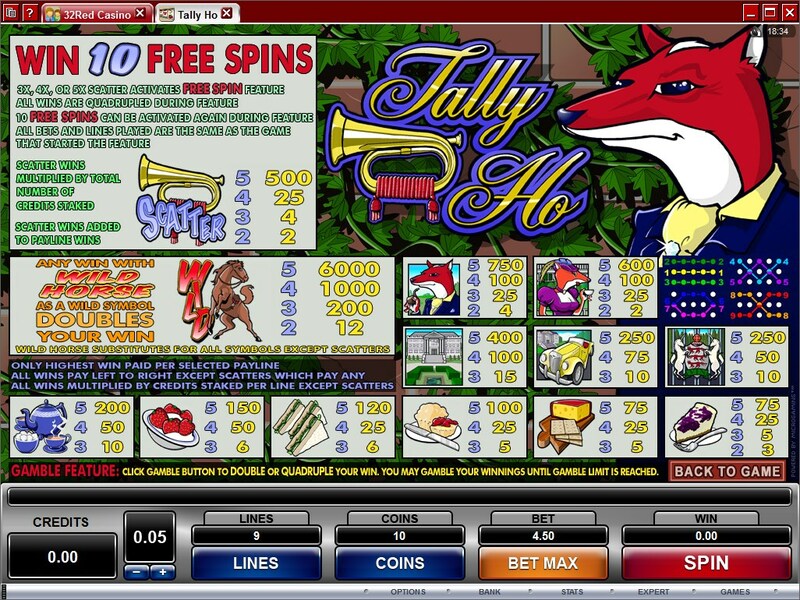 Only 9 paylines are offered in Tally Ho, a 5 reel slot machine with a $60,000 top payout and with a mix of free spins, multipliers, scatters and wilds for features. Two types of symbols are used by Tally Ho. The wild symbol is one of them, applying a multiplier to wins. 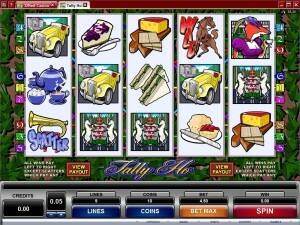 The second one is the scatter, which awards prizes and gives you free spins with 4x multipliers. The Wild Horse symbol will appear on all the reels of Tally Ho. Since it’s acting as the wild, it assists you in the formation of new combinations. One or more wilds can land on a line and together with a few matching regular icons can bring you a win which normally wouldn’t have been awarded. The wild uses a 2x multiplier on the wins it has a hand in forming. It also forms its own combos, of 2 to 5 symbols, going from left to right on the same line. It pays up to 6,000x when this happens. The scattered Trumpet is the other major feature of Tally Ho. As a scatter, the symbol appears and offers prizes from random spots on the reels, without being on the same line. Between two and five Trumpets will be needed for a cash prize, which is valued at 2x to 500x the bet. Free spins are also part of the offer, being obtained whenever 3+ Trumpets are scattered on the five reels. All the wins obtained during these free spins benefit from 4x multipliers, which quadruple their value. The bigger the multipliers, the happier I am with these free spins features, and the ones from Tally Ho are among my favorites. The betting range in use here goes from $0.01 to $90. The line bet goes as high as $10, using up to 10 coins of $1. You decide the coin denomination, the number of coins per line and how many lines should be active. Since the game promises a 6,000x top payout, the prize could have up to 60,000 coins for you, worth $60,000. The theme choice is an unusual one, but that’s what makes it special and worth a look. Its design is not as attractive though, using rather simple symbols, or perhaps it’s just the low resolution that is annoying. Part of the symbols show you the fox aristocrats, others show off the mansions, cars and the heraldry, while the lower paying ones display various types of snacks and teas. Symbols: Wild Horse (wild, 6,000x), Trumpet (scatter, 500x the bet), Mr. Fox (750x), Mrs. Fox (600x), Mansion (400x), Car (250x), Coat of Arms (250x), Hot Tea (200x), Strawberries (150x), Sandwich (120x), Scones (100x), Cheese with crackers (75x) and Cheesecake (75x). The theme is unusual enough, with its British inspired world where foxes take the place of humans. You will like the prizes which are offered by the game, but not the small number of paylines. 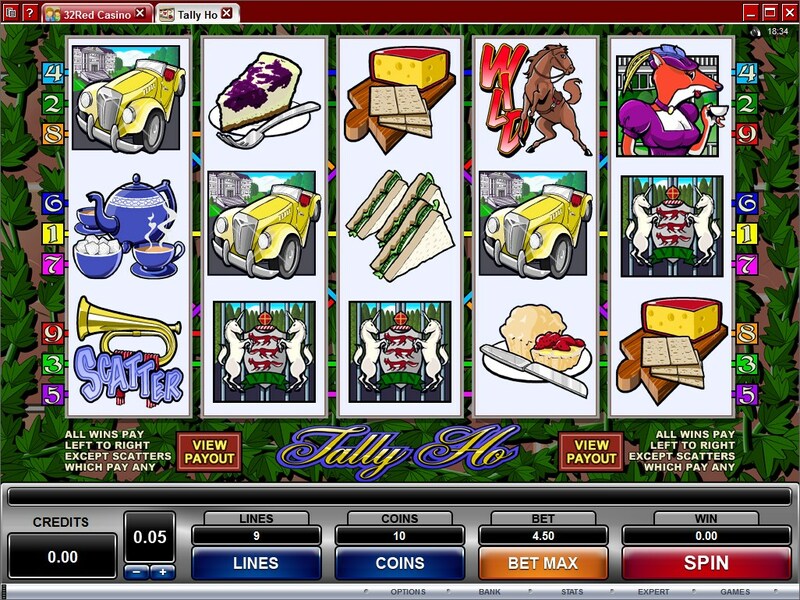 This Tally Ho slot is offered by all online casinos with Microgaming software, playable either in practice or in real money mode.